Dimensions: (1) 10" and (1) 18"
You will have a college dorm checklist for your college supplies throughout the entire year, and then you will have a college dorm checklist for your holiday decorations. Just because you're living in a college dorm room, that doesn't mean you can't do some dorm room decorating for the holidays. In fact, it's even more reason why you should decorate! You want your college dorm room to feel like a home away from home, after all. Part of making your college dorm room feel like a home away from home is decorating for the holidays. There's something comforting about decorating for the holidays, and it's these college dorm decorations that shouldn't be overlooked. When you start thinking about dorm room decorations for the holidays, the first thing to come to your mind is your dorm Christmas Tree with garland, mini dorm lights, and Christmas bulbs. However, there is so much more than that! Don't forget about dorm wreaths! Our 10"/18" Sky Blue Wreath Set comes with two mini dorm wreaths so you can place one on your dorm room door and one above your college dorm desk as part of your college wall decor. 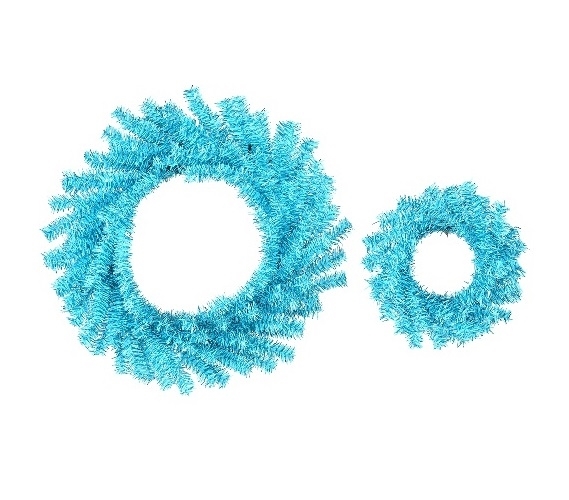 Add fun pops of color to your holiday decorating theme with our 10"/18" Sky Blue Wreath Set!